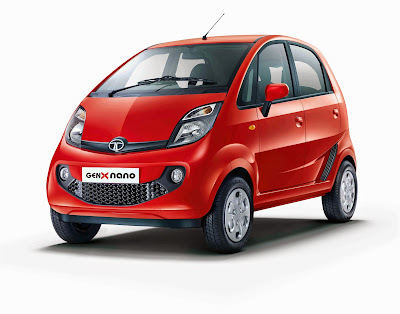 Tata Motors today announced the launch of all-new GenXNano range. The GenXNano comes with a starting price of Rs 1.99 lakhs, for the XE variant and goes upto Rs 2.49 Lakhs, for the XT variant, in Manual Transmission. The Company has introduced two variants – XMA and XTA with ‘Easy Shift’ Automated Manual Transmission. The XMA variant will be made-to-order and will be available for sales from August 2015. The XMA variant is priced at Rs 2.69 Lakhs and the top-end, XTA variant is priced at Rs 2.89 Lakhs Ex-showroom, Delhi. The Tata Nano’s engine has the same 624cc two-cylinder MPFI petrol generating peak power of 37.5bhp. The company has added a new cylinder head and aluminium block to help the car run smoother than the earlier models. The new range comprises of five variants, three with a four-speed manual transmission (XE, XM, XT) and two variants (XMA, XTA) come equipped with a five-speed AMT gearbox. The car offers new features such as Zest-inspired steering wheel, smoke headlamps,front power windows, amphistream music system with 4 speakers and Tata signature grille. The AMT variant offers boot space of 94 liters while the Manual Transmission offers 110 liter boot space. The car has a larger 24 liter fuel tank for longer driving range. The earlier models had capacity of 15 liters. The GenXNano will be available for sale, across the country in over 450 Tata Motors sales outlets and will offer warranty of 4 years or 60,000 km (whichever is earlier). The GenX Nano XE and XT (manual transmission) will cost Rs 1.99 lakh and Rs 2.49 lakh. The Automatic version of GenX Nano Easy Shift XMA and XTA will be priced at Rs 2.69 lakh and 2.89 lakh respectively. The car will come in wide range of colors – Sangria Red (NEW), Persian Rose (NEW), Pearl White, Meteor Silver, Royal Gold, Dazzle Blue and Damson Purple.